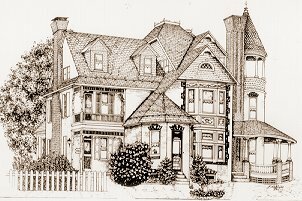 Located 18 miles east of Gettysburg and 12 miles east of York in the East Berlin, Pennsylvania National Historic District, the Bechtel Victorian Mansion Bed & Breakfast Inn is living proof of lifestyle in the late nineteeth century. Upon entering the Victorian Parlor, one is transplanted back to 1897. The beauty and intricate craftmanship evident in the rooms are reflected in the cherry woodwork, gold picture rails and the original restored 1897 wallpaper. Cherry louvered horizontal shutters on pulleys can be stored beneath the liftable hinged window sills. The ornate large brass electric chandelier is the original fixture installed when the mansion was built. Built in 1897, by Joseph Dise for the William G. Leas Family, the original interior and exterior charm and special attributes of this vintage Victorian Mansion have been carefully preserved. Take a look at America's History first hand, and see into an almost long forgotten era. Only a few miles away you can see what it was like to be on the battlefield at Gettysburg during a time of great national conflict. The surrounding western frontier of the Pennsylvania Dutch countryside is scenic and contains excellent cycling roads and a number of Pennsylvania German lattice brick barns. 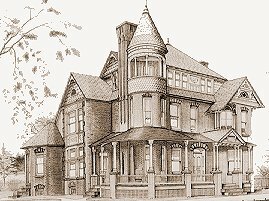 Bechtel Victorian Mansion is very popular with history, architecture and Civil War buffs, as well as a honeymoon and romantic getaway retreat. You won't go hungry here as a full breakfast is served every morning either in the Dining Room in Victorian splendor or the Breakfast Room. The dining room has many lovely features such as the etched glass windows, the built-in oak comer cupboard, the antique tall gilded pier mirror, and the charming original brass chandelier. The Breakfast Room was the original cooking kitchen of the mansion and has a Royal Bride stove installed in the cooking chimney comer. This and other Gettysburg Bed and Breakfast Inns can be found here in The Register.